The only familiar and enjoyable part of the show now is Ryan and Randy – and they are not miracle workers. Whomever added Ellen to this mix does not have a clue what works and what does not. I have no interest at all in what Ellen wants to say to the singer or to us. This show is now pathetic. I love Ellen and her own show, but IF IT"S TRUE that she has no clue about talent judging, she shouldn't be a judge on American Idol. If it's NOT TRUE, then she may just need a little time, as she just started. I think Simon is half the entertainment of watching the show. When he leaves the show, I won't be as interested in watching it every week. It just seems as though Ellen Degeneres is sort out out of her realm–she does not seem focused on this program but is merely there to catch more of the limelight–I really like her but she is out of her talk show host occupation–she seems nervous and unsure of herself and mimics and copies some of the other judges comments–I wish she would shut up and think about what she is saying and then give her input on the show–I think she'll be ousted before all is said and done–she is not original with her comments and wish her well! I don’t watch “American Idol” just like I don’t watch “The Apprentice.” The two shows have too much Americana for my taste. But I think Kris Jenner is more Americana than Ellen DeGeneres and Americans might like the show a lot better if she was on. People need to take a look at themselves if they only watch the programme to see simon cowell putting people down. Only one question for you folks. WHO DIED, AND MADE ELLEN DEGENERATE, A JUDGE OF TALENT OF ANY KIND???????? 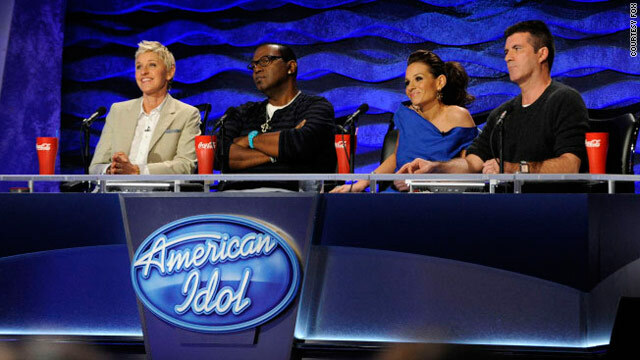 Ellen DeGeneres is a refreshment to American Idol. She is sane and doesn't act as if she is all drugged up and out. She has sound constructive criticicm without destroying the spirit. She has original comments without the same phrases that everyone uses. Hopefully, she remains on American Idol. To my surprise, I like her better than Paula. I think Ellen brings some good traits to the program. She is very honest and sincere; I think the contestants will appreciate her. I think Ellen is doing a great job. She's very down to earth and sincere. And heck – what do any of us know about talent? The show has "jumped the shark" Bang the gong now! I think its sad the people are so narrow minded. Anybody can sit on a panel. Its entertaining whoever has witty remarks, and comments. All these shows are the same anyway....There's someone pro, con, and bias.....I'm ashamed of the American public when I read and hear such silly crap! Change isn't easy, but thats LIFE!! I don't even think Ellen does a good job on her show. She's not even a good interviewer. What she's good @ is playing games & giving things away. Really–if she stopped giving gifts away & stopped playing those silly games her audience certainly would be less. She certainly likes to brag herself up–how many times did we have tohear about her cover on Oprah & her being the next judge on Idol-too many!